The song cycles that Messiaen wrote between 1936 and 1945 perfectly convey the expressive and aesthetic evolution in his life and art over these years. They occupy a strikingly important place in his musical biography, and together form a composing workshop in which his latest innovations could be developed, while also exploring the full range and variety of writing for the voice. Po�mes pour Mi is laid out on the largest scale � a richly composed cycle, intense and at times heroic. Chants de Terre et de Ciel, lighter in tone but still deeply expressive, celebrates the joy and energy of married love and family life. 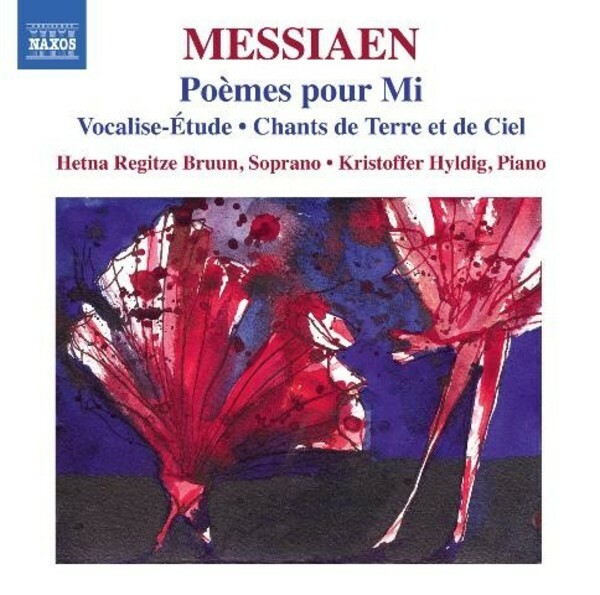 Messiaen�s writing for piano, organ or large orchestral forces, and his very idiomatic writing for voice tends to be a very overlooked element of his compositions. It is worth noting that almost all the texts are by Messiaen himself. He also once said that anyone wishing to understand his musical language should study these two early song cycles because �they are true in sentiment and typical of my manner�. In some ways they hold the key to his early style.